Yes, I realize I am a little behind on this post. Cut a girl some slack. I have been in the process of moving (don't worry, I will go into this ad nauseam soon) and have completely fallen off the Gravytrain. This is my attempt at catching up! In my finest moment of racial profiling, I asked my Puerto Rican friend, Christian, to plan the evening's outing. 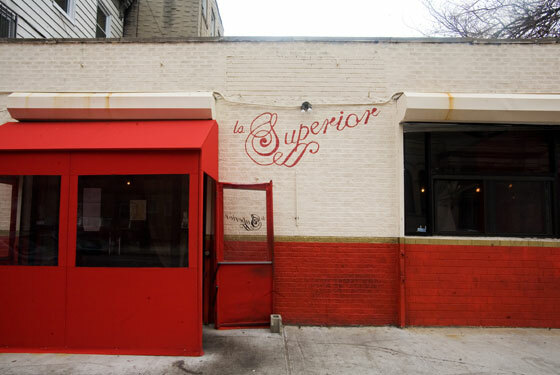 He chose La Superior in Williamsburg for dinner. Don't let these images fool you. It was a busy place and got packed. We had to wait a while for a table and then squeezed our party of six into a four person table. Needless to say, we weren't the wait staff's favorite group. They weren't terribly efficient in return, but we still had a good time. I failed to photograph my yummy squid ink tacos (like this pasta) or Kurt's sandwich drowned in hot sauce (his new obsession), but I did capture a crappy iPhone image of my margarita. I don't recall the name (which I asked Christian to pronounce for me fifteen times) or what was in it, but it was a beautiful purple and yummy. After we stuffed ourselves with Mexican food, Christian took us to a new beer garden in his neighborhood. He kept riding his bike past it on his way to work and had been looking for an occasion to go. 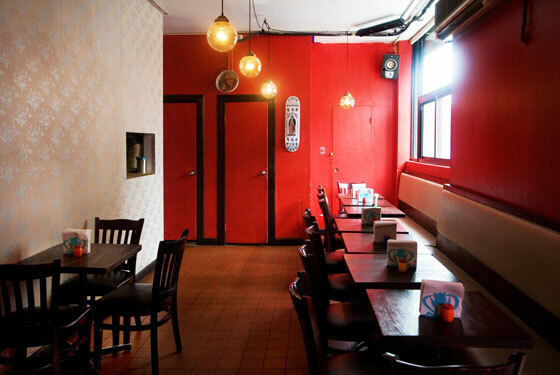 For some reason, I was blown away by Spritzenhaus. It is a huge space in Greenpoint near the park with huge glass garage doors that open onto the sidewalk. The details inside were amazing. We decided the place must have cost a fortune. I really loved the industrial modern look. The marble top tables weren't too shabby either. One of my favorite touches was the bathroom washbasin. Huge shower heads serve as the faucet and are controlled by a pedal on the floor. Love. I look forward to going back here, especially when the weather is nice and grabbing a seat that looks out on the park. Maybe a nice destination when my mom and sister come to visit next month!